Many people love a richly scented candle, with a smell so strong you might even be able to smell it when it's not burning. Such a candle can clear a bad smell out of a room in no time flat and keep your rooms smelling fresh all the time. What Makes a Richly Scented Candle? The best candles in terms of scent are made with the best quality of fragrance oils. Whether you're making your own or shopping for candles at your favorite store, there are a wide range of scented oils available for candle making. The type of oil used can affect the quality of the scent dramatically. The best candles that will keep their scent and disperse it well are those that actually smell the most like the thing they're supposed to smell like. If you can pick up a candle, sniff it and identify what the scent is without looking at the label, that's a big hint that you've got a good quality fragrance oil in the mix. Additionally, if you're walking around the mall and can smell the candle store before you can see it, odds are good there are strongly scented candles inside. The amount of fragrance oil that is used in a candle will also determine how strong it smells and whether the smell lingers even when the candle is not lit. While you won't know how much oil has been used in candles you don't make yourself, if you make your own candles you can keep track of how much fragrance you used and how well you liked the results. Sometimes you will see websites promoting "triple scented candles" or candles that have three times as much scent as regular candles. This is mostly marketing hype - there's actually no way to get the candle to accept more fragrance. In fact, it can be dangerous to put more fragrance oil into a candle than recommended. If you're more of a do-it-yourself crafter, it's important to follow the instructions for the candle you're trying to make to ensure you don't add too much fragrance. If you're experimenting with your own candle recipe, check the package of fragrance oil for a recommendation on how much you should use. Some oils can go up to 1.5 to 2 ounces of oil per pound of wax, while some highly concentrated and higher quality oils only need 1.2 ounces or so per pound to make a richly scented candle. 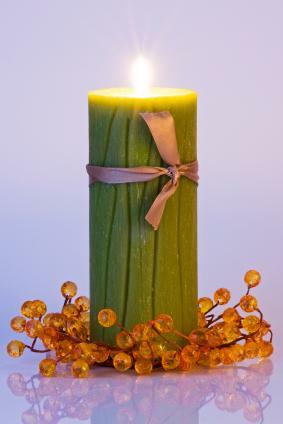 To keep your candles smelling great for as long as possible, store them out of direct sunlight and away from heat. Light and heat can degrade the chemicals used to scent some candles, so just having them out when you want to use them will slow the process. If you buy a lot of candles and don't need them right away, keep them in their original packaging if possible. This will hold the scent in and keep it smelling great longer. Jar candles are a great choice when you're looking for candles to scent your home even when they aren't lit; just lift the lid for a rush or fragrance. Remember to put the lid back on and store it away from bright light as much as possible to keep the good smells coming.